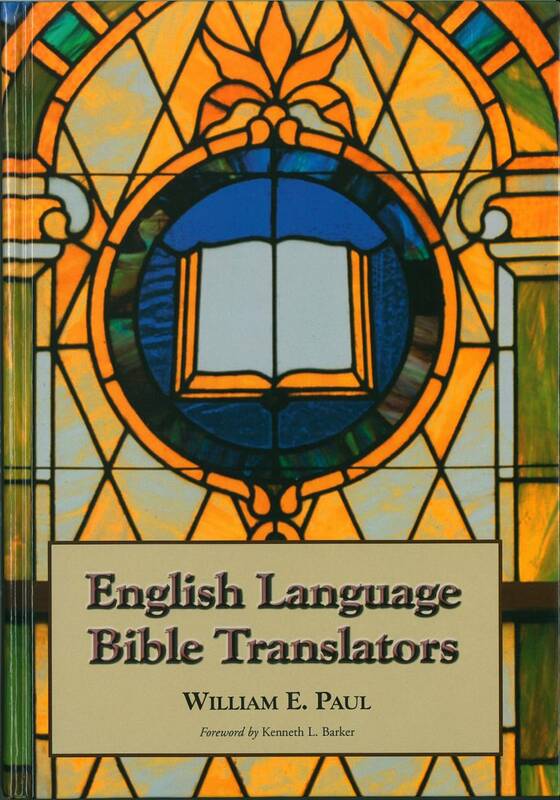 This list contains some of the catalogues listing different Bible translations. 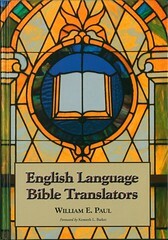 Blom, F., Blom, J., Korsten, F., & Scott, G.
Comments: This is probably the most comprehensive listing of English Bible translations. 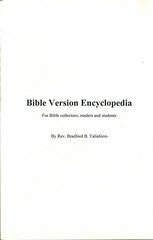 It is divided into 25 sections (Bibles, Hebrew Scriptures, New Testament, Apocrypha, etc.) and within each section there is a chronological list of all translations known. For each entry, Chamberlin gives information on the first edition and other significant reprints. 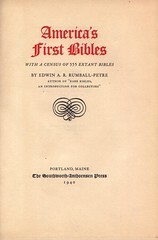 Overall, a first rate publication and a necessity for any serious Bible collector. This is still available new at amazon.com or can sometimes be found at abebooks.com. 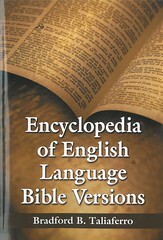 One helpful feature of the Encyclopedia Of English Language Bible Versions (EELBV) is each version is given a unique identifier that will not change in future editions. Taliaferro designed the system so it could be expanded to even accommodate new discoveries. Many of the versions described in the EELBV are also listed on this website. An index linking the identifier to website entries is provided here. Comments: This book includes information on about 500 different versions. They are arranged alphabetically by the version name and several indices allow a person to quickly locate any entry. Most entries include short historical notes and brief details. A sample verse is included for many translations and bibliographic information on a representative example is also provided for many versions. 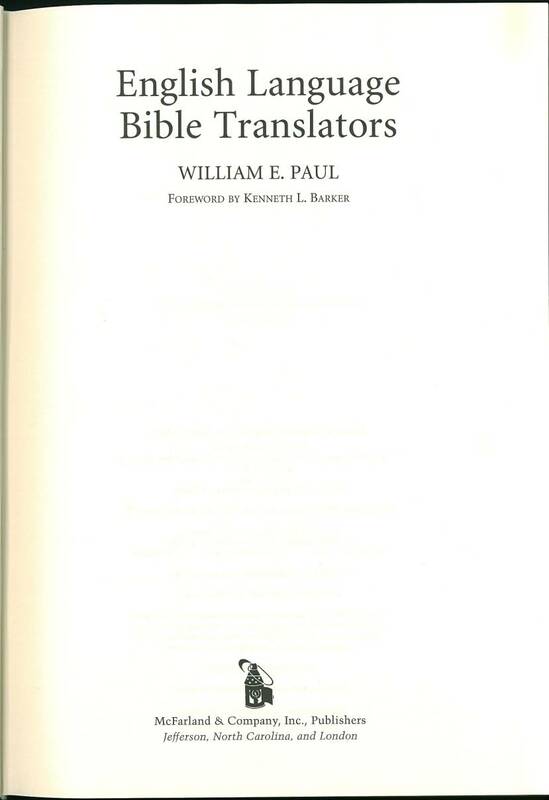 Unlike Hills and Herbert, this book focuses on translations, rather than physical books. This means it is more useful for someone interested in collecting translations and not books. 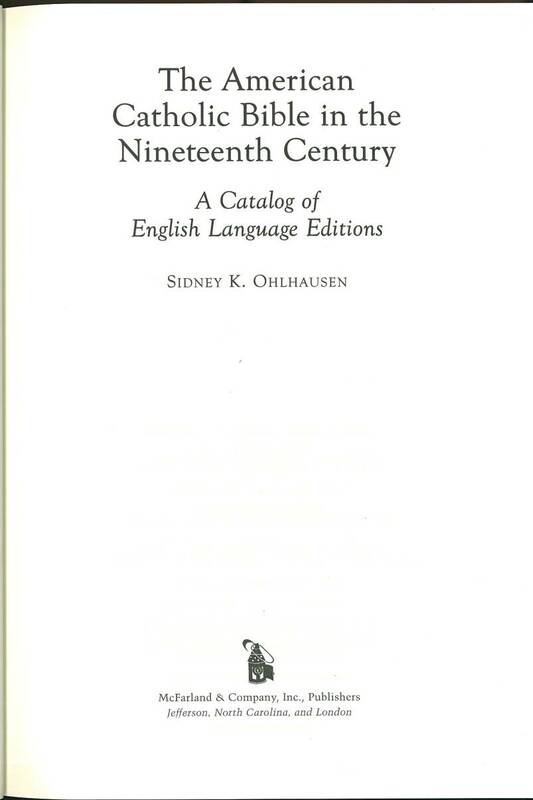 One of the strengths of this volume is it provides information on many versions that are only available on-line. It also provides information on the location of on-line facsimiles of hard to find versions. Each entry is given a unique reference number that corresponds to an entry in Taliaferro’s master data base. 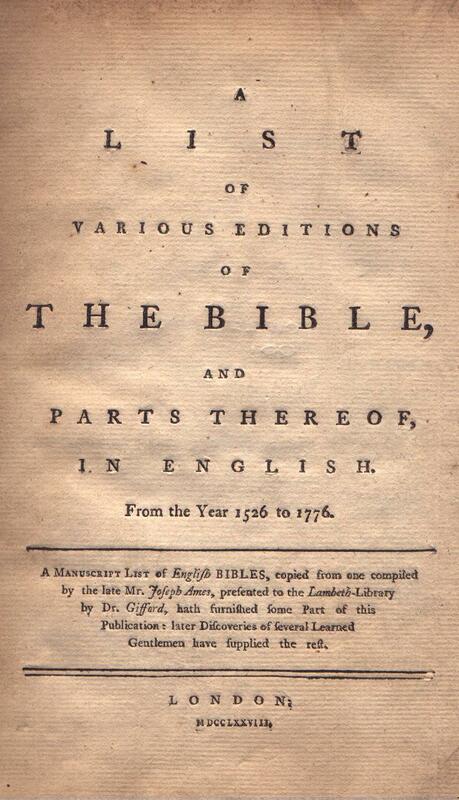 For example, Noah Webster’s revision of the King James Bible is assigned the reference number CN00010. Comments: This is no longer available. 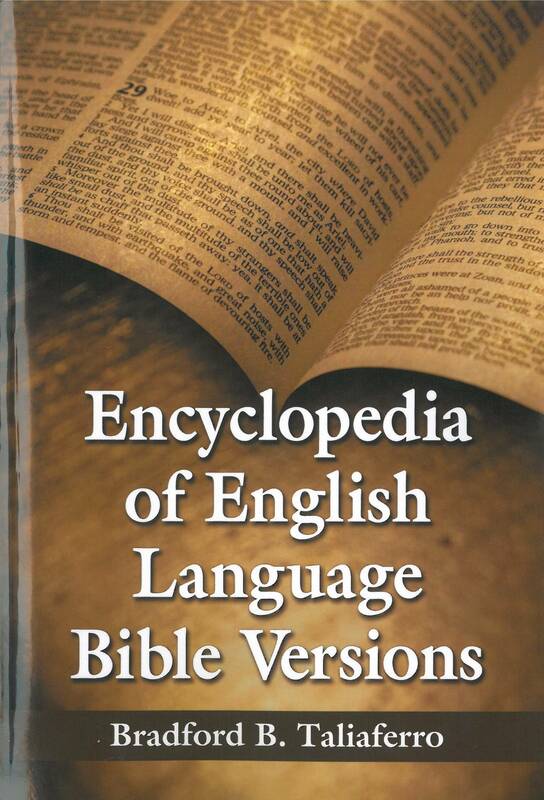 It has been superseded by the Encyclopedia of English Language Bible Versions published by McFarland press. More information is available here. Comment: This is sometimes abbreviated as DMH for Darlow, Moule and Herbert or simply as Herbert. 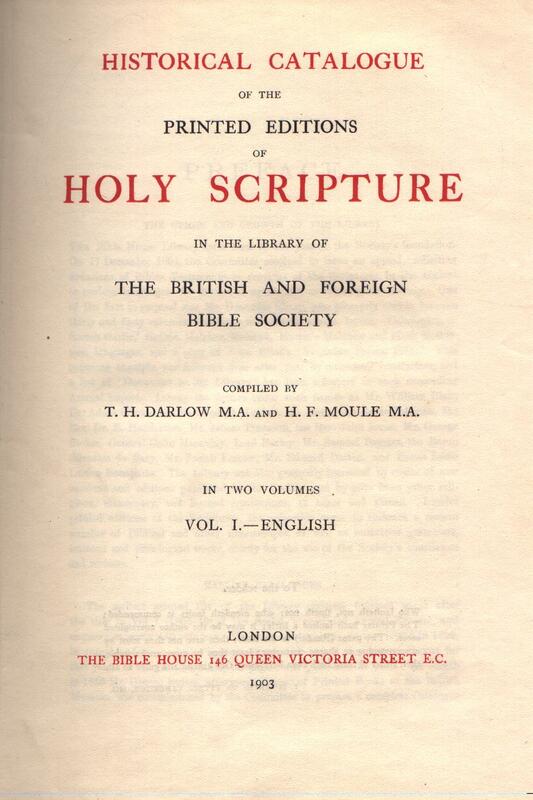 As the title says, this is an expansion and revision of Darlow and Moule's 1903 catalogue of the holdings of the British and Foreign Bible Society's (BFBS) library. 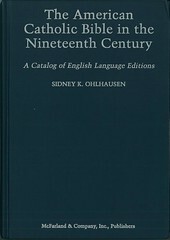 The original 1903 catalogue included translations into many different languages; this book only contains the English language portion. It is arranged chronologically beginning with Tyndale's first New Testament fragment in 1525 and concludes with the New English Bible New Testament in 1961. 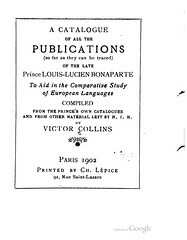 The catalogue is primarily concerned with the holdings of the BFBS library but does include information on significant early translations from other collections. It gives extensive bibliographic and historic information for many translations and is very valuable for identifying early editions. While this is approaching its 50th anniversary, it is still a very valuable book and many rare book dealers will reference this book when offering rare books for sale. 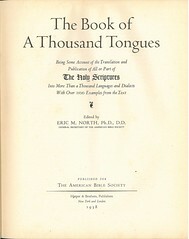 While this is not longer in print, copies are frequently available at abebooks.com. 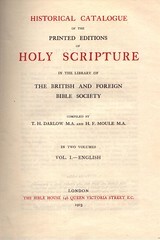 Title Historical Catalogue / of the / Printed Editions / of / Holy Scripture / in the Library of / the British and Foreign / Bible Society / Compiled by / T. H. Darlow M. A. and H. F. Moule M. A. 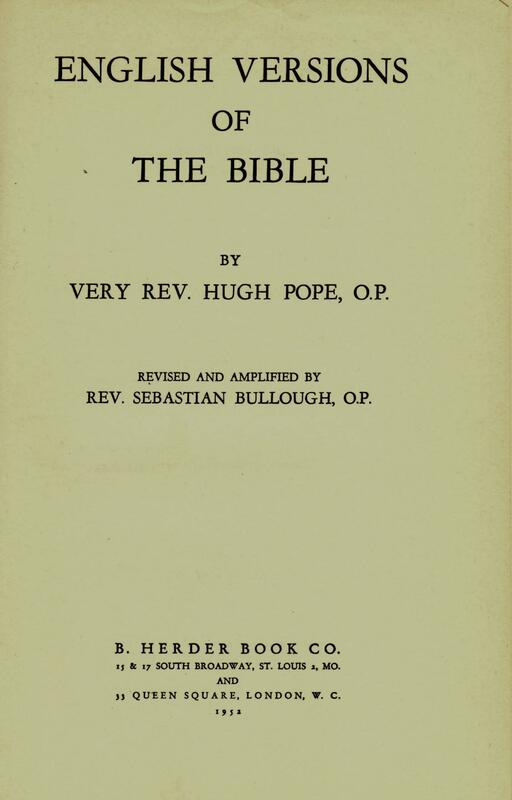 / in Two Volumes / London / The Bible House 146 Queen Victoria Street E. C.
Comments A comprehensive catalogue of editions of Scripture in all the known languages of the world as of 1911. 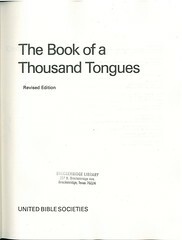 Volume I which includes English translations was updated in 1968 by Herbert (q.v.). However, there has never been a comprehensive update of editions in other languages. 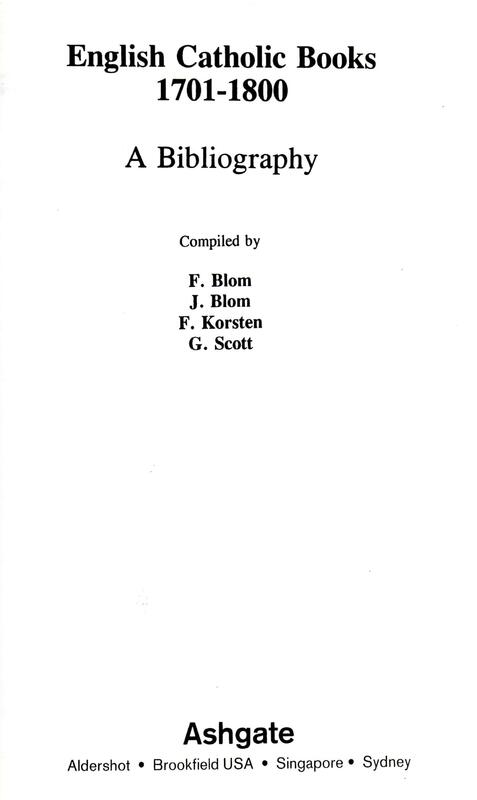 Although the title refers to two volumes, the set is actually published in four parts. Reprinted in 1993 by Maurizio Martino. 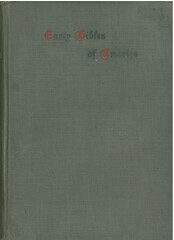 Facsimile: A pdf facsimile of Volume I.-English is available at books.google.com. Comments A rare (only 220 copies printed) and huge quarto volume listing early editions of the Bible in original and classical languages. Title Rhemes and Doway. / An Attempt / to shew what has been done by / Roman Catholics / for the diffusion of / The Holy Scriptures / in English. / by / The Rev. Henry Cotton, D.C.L. / Archdeacon of Cashel, &c. / Oxford / at the University Press. / M. DCCC. LV. 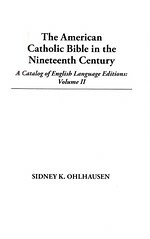 Comments A comprehensive bibliography of English language Catholic editions up to 1855. 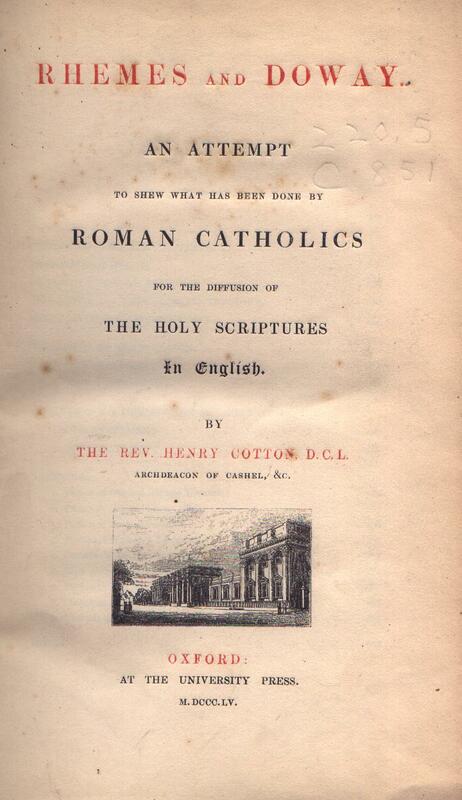 Although written with an anti-Catholic animus, it is valuable for its detailed collations of early editions. 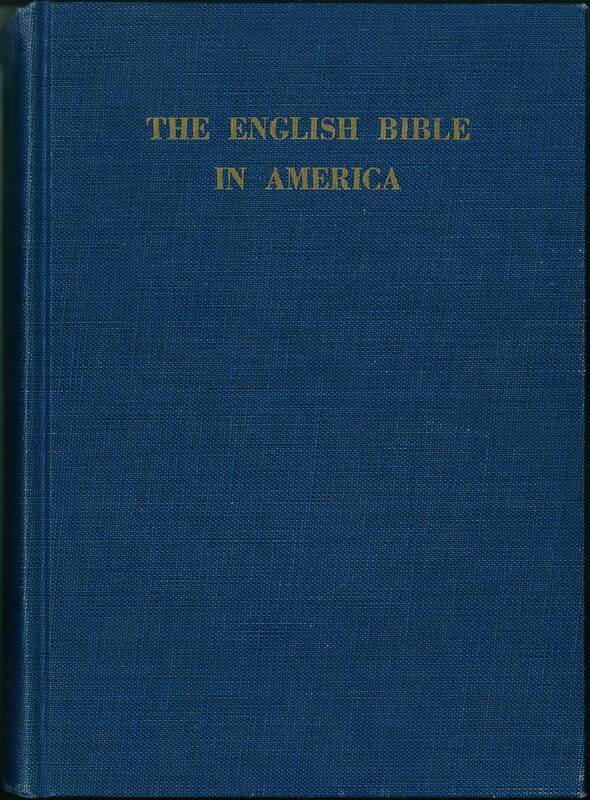 Comments: This book is similar to Herbert's work in that it is primarily a listing of the holdings of American English Bibles in the American Bible Society's library and the New York Public library. It does include information on other significant volumes and indicates the libraries where they may be found. 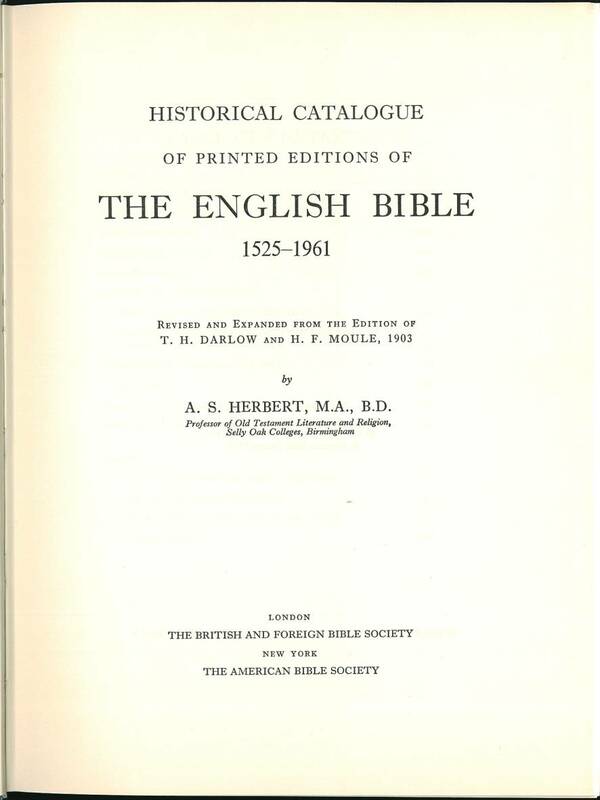 It is divided into two parts; the first part covers 1777 to 1825 and attempts to list every English Bible or testament published during that period. 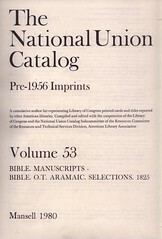 The second part covers 1825 to 1957 and only includes new or significant books. 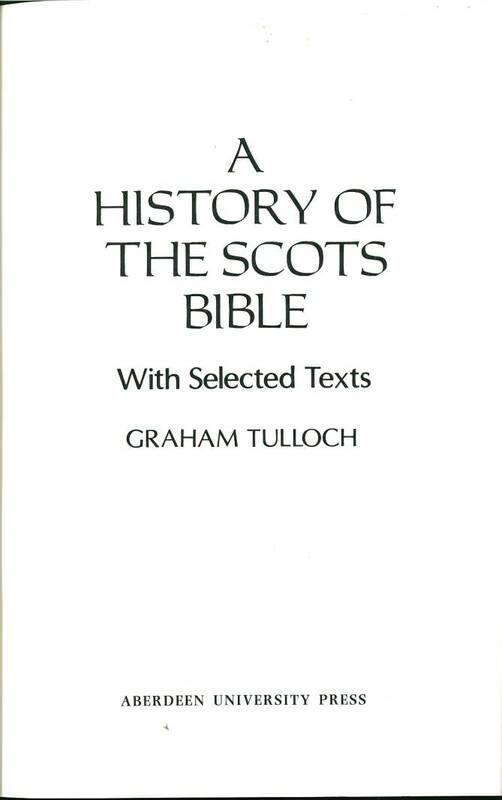 It is a chronological list beginning with Robert Aitken's 1777 New Testament and ending with the publication of the Revised Standard Version Apocrypha in 1957. 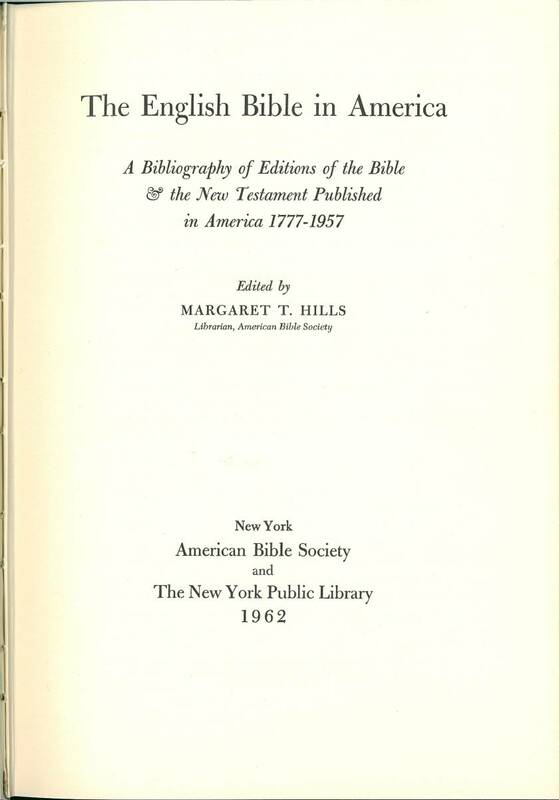 The bibliographic and historic information is very valuable and this is a "must have" for anyone interested in American Bibles — especially for the early editions. Despite its age, this too is a very valuable reference book and deserves to be in the library of every serious Bible collector. 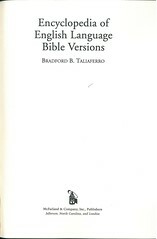 This is usually available used at abebooks.com and has been reprinted by Martino Publishing. 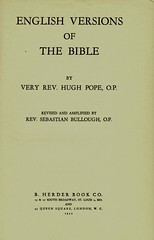 Title: English Versions of the Bible by Very Rev. 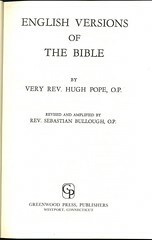 Hugh Pope, O.P. Revised and Amplified by Rev. Sebastian Bullough, O.P. 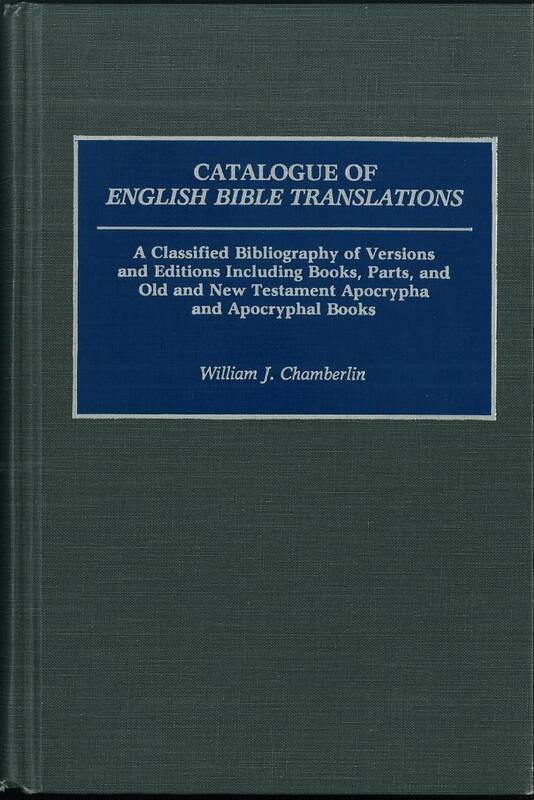 Comments: Instead of a simple catalog of English Bibles, this book has chapters devoted to early translations with special emphasis on the Catholic translation completed at Rheims and Douay. 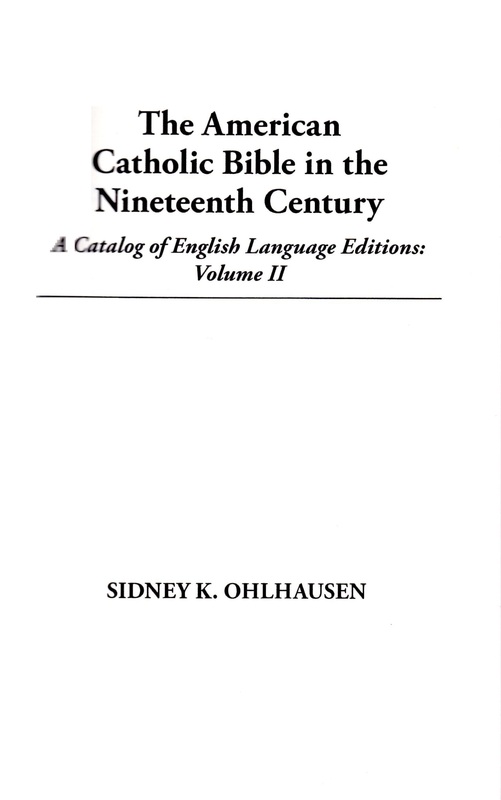 Part Four of the book discusses the various revisions of the Catholic Bible in the 18th and 19th century and some information on independent Catholic translation of the early 20th century. 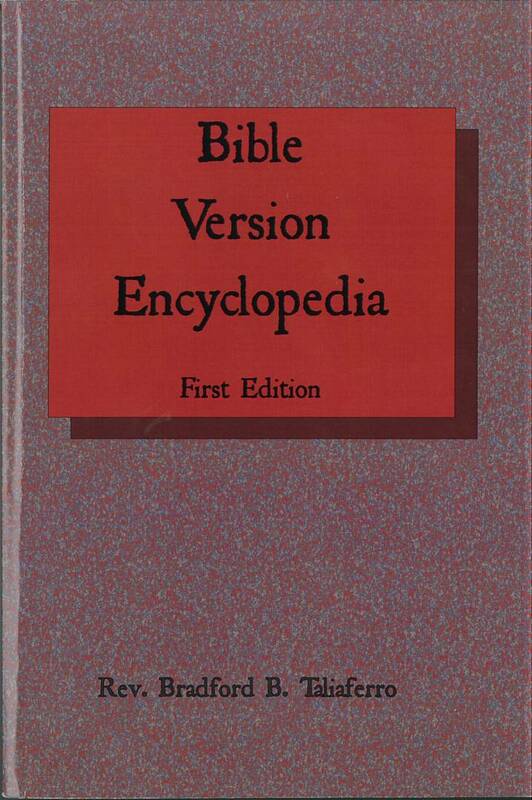 It also contains some information on Protestant versions since the King James Version. 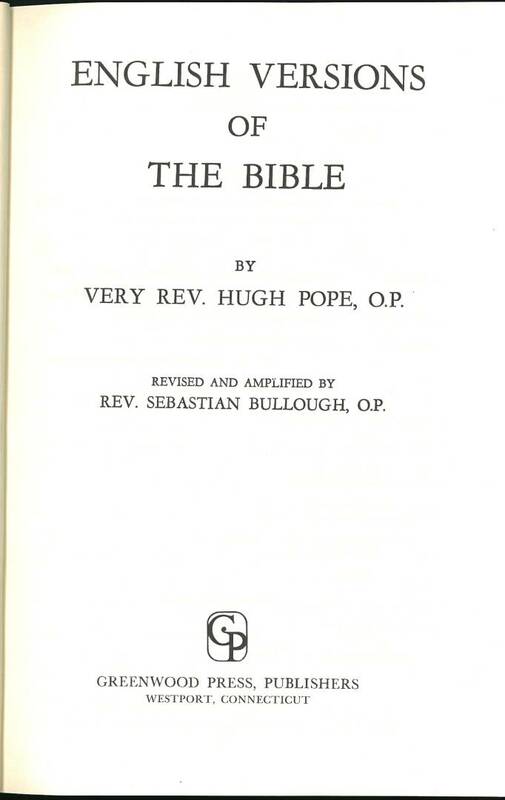 Even though it was printed in 1952 the information for collectors of Catholic Bibles is very useful. 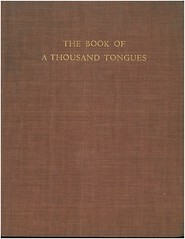 This can sometimes be found at abebooks.com]. 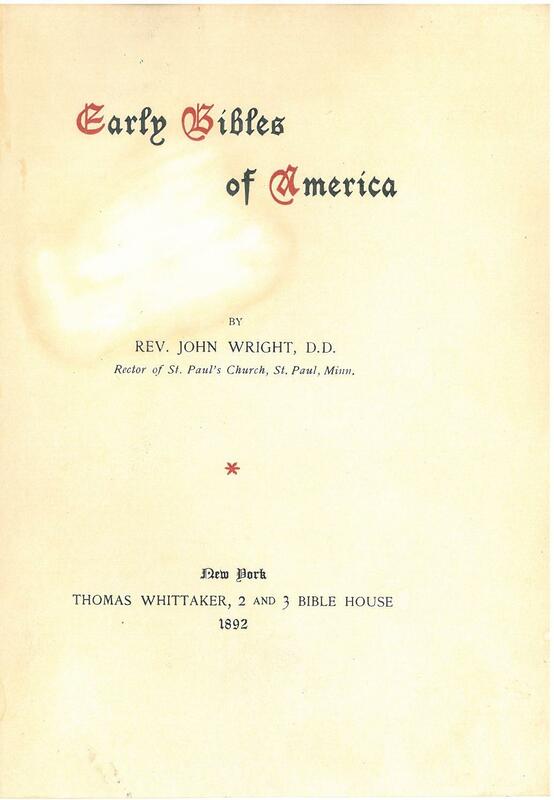 Title: Early Bibles of America by Rev. John Wright, D.D. Rector of St. Paul's Church, St. Paul, Minn. 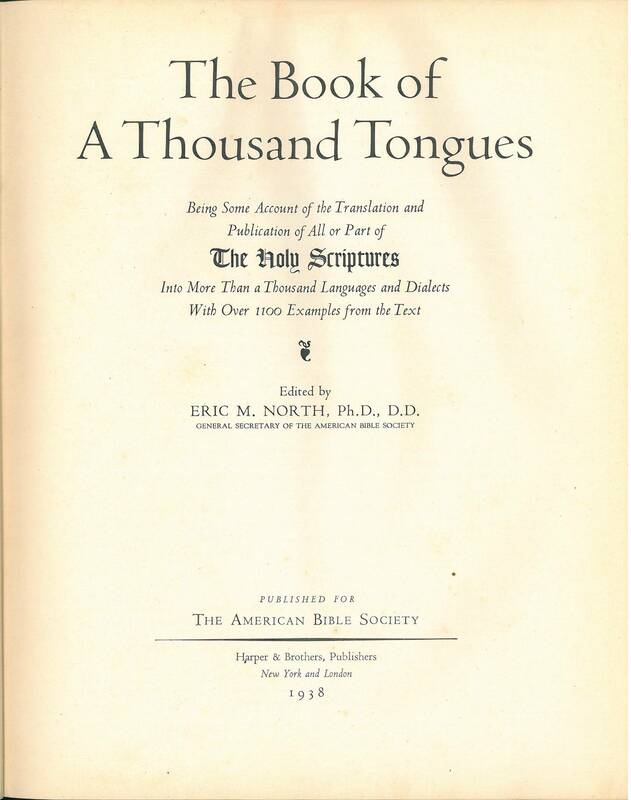 Comments: This book has chapters devoted to many "first" bibles in America including the Eliott Bible (the first Bible printed in America), the Aitken Bible (the first English Bible printed in America), the Charles Thomson translation of the Septuagint. 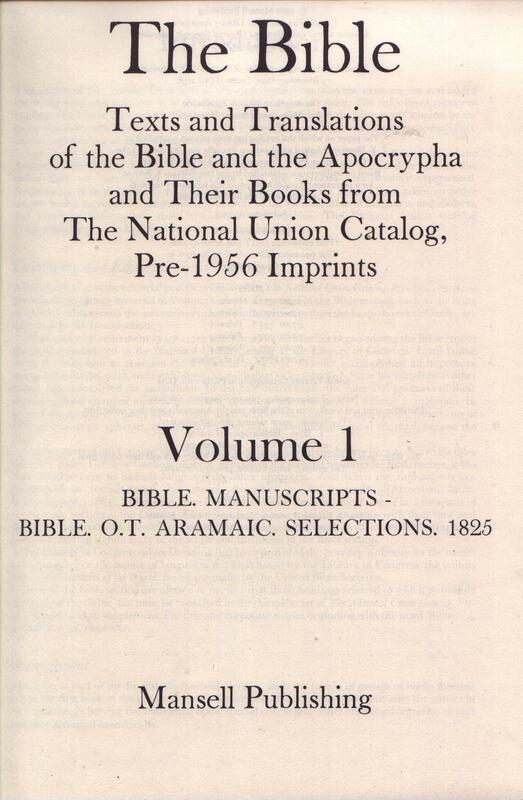 Four title pages are reproduced in facsimile making this useful for identifying early Bibles. This book contains much information beyond a simple catalog. Anyone who has an interest in early American Bibles or early American printing will find much useful information in this book. 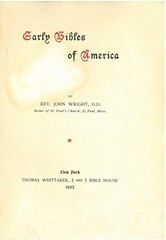 Wright published an updated edition in 1894. 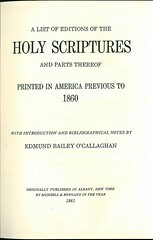 Facsimile: A pdf facsimile of the 1892 edition is available at archive.org. 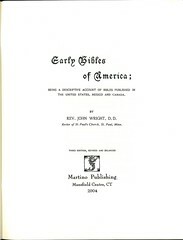 Title: Early Bibles of America; Being a Descriptive Account of Bible Published in the United States, Mexico and Canada by Rev. John Wright, D.D. 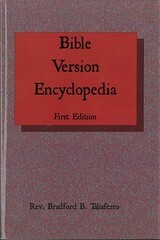 Third Edition, Revised and Enlarged. 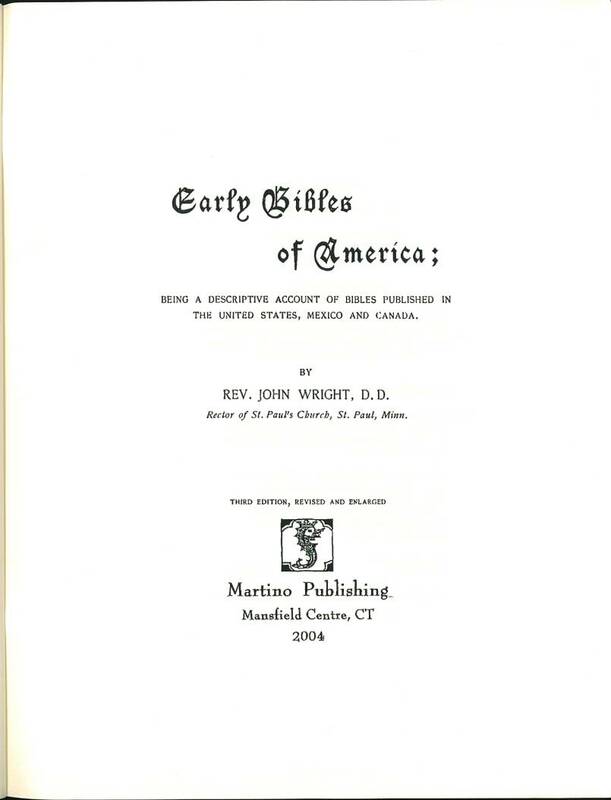 Comments: This book has chapters devoted to many "first" bibles in America including the Eliott Bible (the first Bible printed in America), the Aitken Bible (the first English Bible printed in America), the Charles Thomson translation of the Septuagint, and Noah Webster's Bible. Many title pages are reproduced in facsimile making this very useful for identifying early Bibles. This book contains much information beyond a simple catalog. Anyone who has an interest in early American Bibles or early American printing will find much useful information in this book. 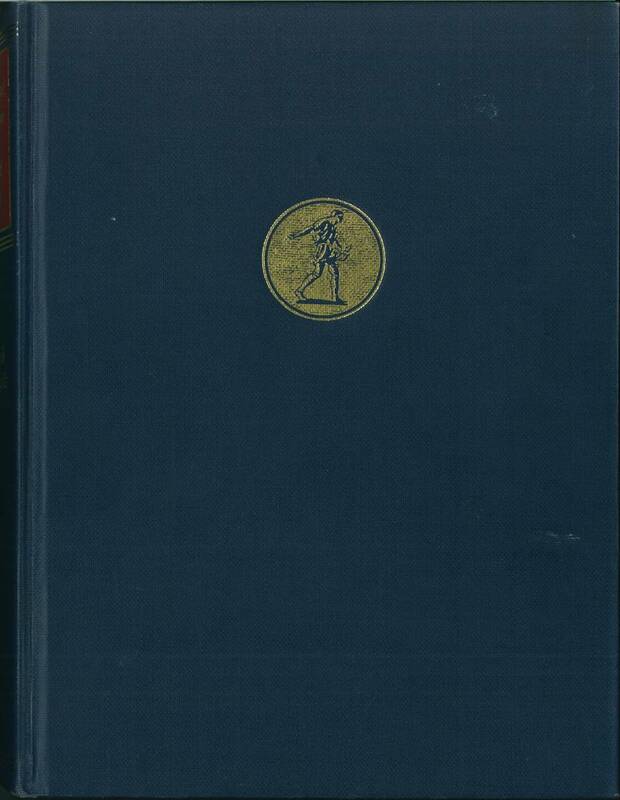 It was originally published in 1894 but has been recently reprinted by Martino Publishing. 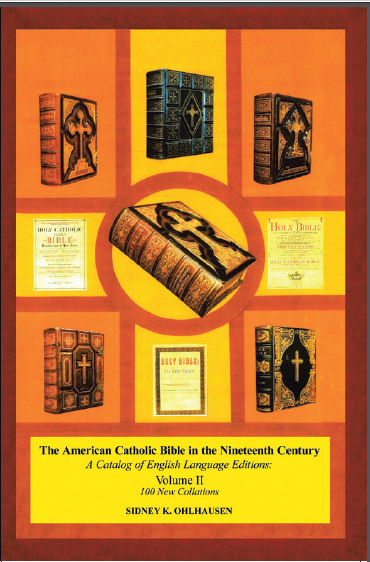 Comments: This recently published catalog is devoted to the American Catholic Bible in the Nineteenth Century. 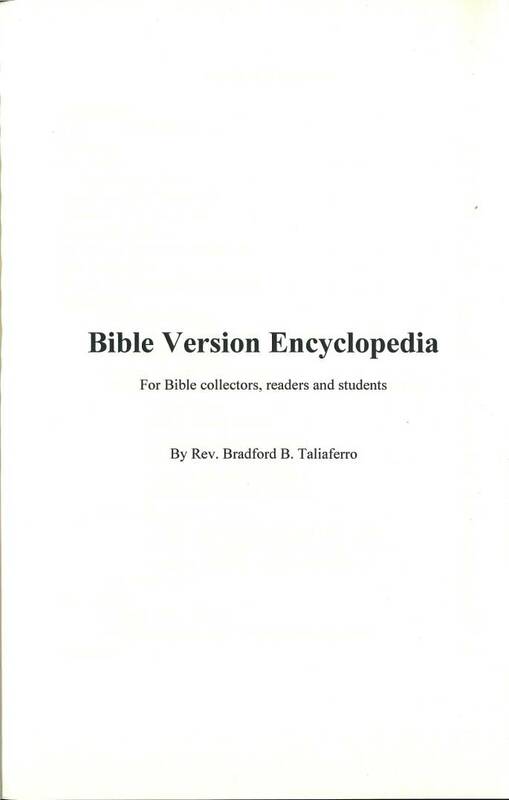 It lists every edition of every Catholic Bible and New Testament with facsimiles of the title pages and detailed bibliographic information that allows a person to quickly identify a particular Bible or Testament. This is useful to any Bible collector, but especially to those interested in Catholic Bibles. This is in print and available from douaybible.com. 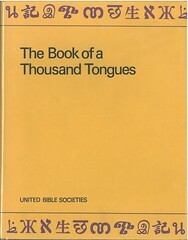 Title A / List / of / Various Editions / of / The Bible, / and / Parts Thereof, / in English. / From the Year 1526 - 1776. / A Manuscript List of English Bibles, copied from the one compiled / by the Late Mr. Joseph Ames, presented to the Lambeth Library / by Dr. Giffard, hath furnished some Part of this / Publication: later Discoveries of several Learned / Gentlemen have supplied the rest. / London ; / MDCCLXXVIII. 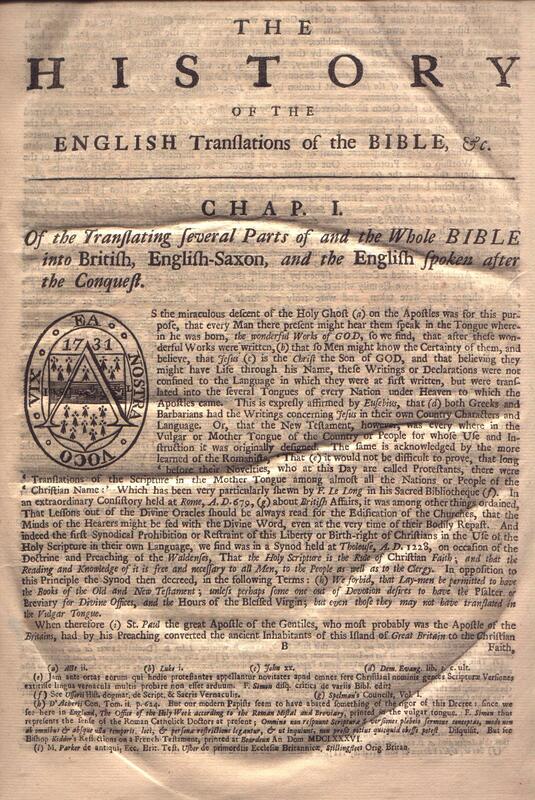 Comments One of the earliest attempts to catalogue English editions of Scripture. It is in two sections, listing Bibles and New Testaments in the first, and Psalters in the second. 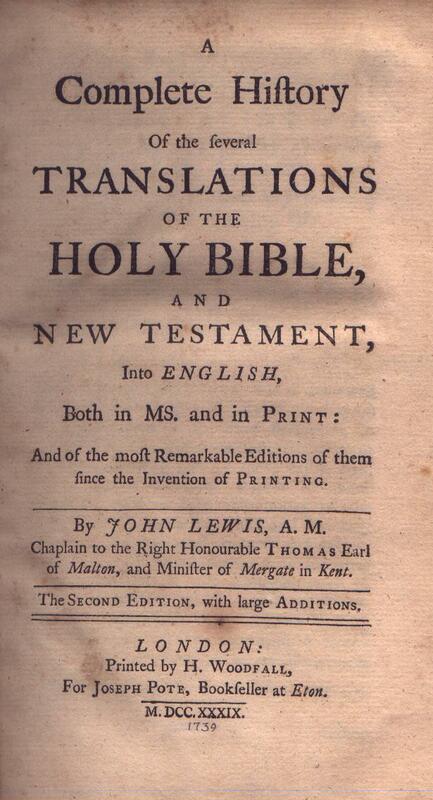 Title The / History / Of The English Translations of the Bible, &c./ By John Lewis, A.M. Chaplain to the Right Honourable Thomas / Lord Malton, and Minister of Margate. 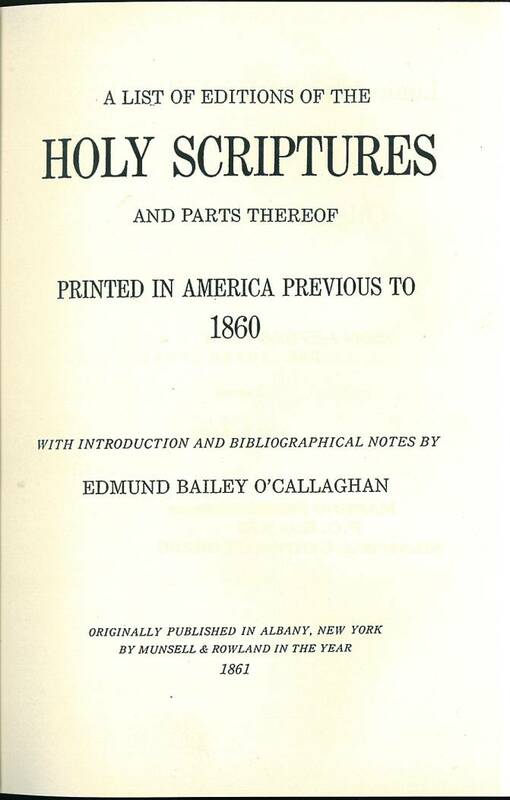 Title A / Complete History / Of The Several / Translations / of the / Holy Bible, / And / New Testament, / Into English, / Both in Ms. and in Print: / and of the most remarkable editions of them / since the Invention of Printing. / By John Lewis, A.M. / Chaplain to the Right Honourable Thomas Earl / of Malton, and Minister of Margate in Kent. 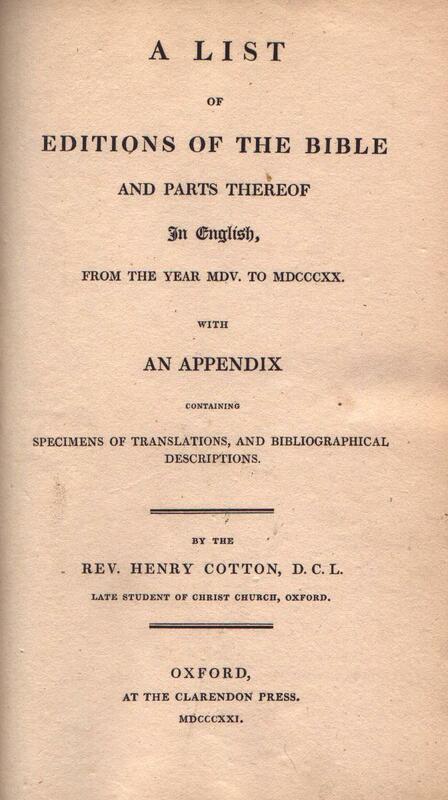 / The Second Edition, with large Additions, / London: / Printed by H. Woodfall, / for Joseph Pote, Bookseller at Eton. / M.DCC.XXXIX. 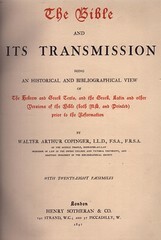 Contents The second edition of Lewis' History; the first published as a separate volume. 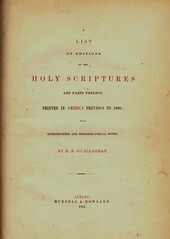 Title A / Complete History / Of The Several / Translations / of / The Holy Bible / And / New Testament / Into English, / Both in Ms. and in Print: / and of the most remarkable editions of them since the / invention of printing / By John Lewis, A.M. / Chaplain to the Right Honourable Thomas Earl of Malton, and Minister / of Margate in Kent. 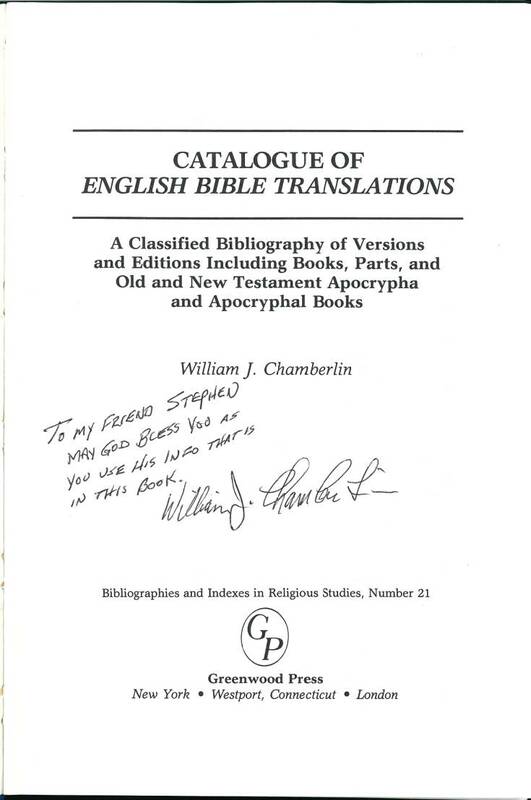 / The Third Edition / To which is now added, / A List of Various Editions / of the / Bible, and Parts thereof, in English, / From the Year 1526 to the Present Time, / Extracted from Bishop Newcome's Historical View of English Biblical Translations; / With a Continuation by Another Hand. / London: / Printed for W. Baynes, 54, Paternoster Row. / 1818. 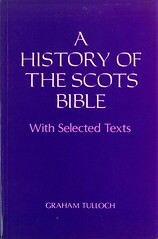 Contents The third edition and best edition of Lewis' History with addition of a list of English language editions of Scripture. 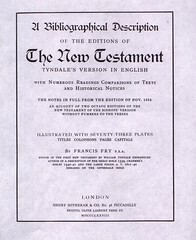 Title A Bibliographical Description / of the Editions of / The New Testament / Tyndale's Version in English / with Numerous Readings Comparisons of Texts / and Historical Notices / the Notes in Full from the Edition of Nov. 1534 / an Account of Two Octavo Editions of the / New Testament in the Bishops' Version / without Numbers to the Verses / Illustrated with Seventy-Three Plates / Titles, Colophons Pages Capitals / by Francis Fry F.S.A. / Editor of the First New Testament by William Tyndale Reproduced / Author of a Description of the Great Bible 1539, Cranmer's / Bibles 1540-41 and the Large Folios A.V. 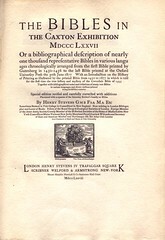 1611-40 / Remarks on the Coverdale Bible / London / Henry Sotheran & Co. No. 36 Piccadilly / Bristol Olive Lasbury ParkSt. / MDCCCLXXVIII. 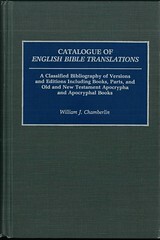 Contents Highly detailed and well illustrated bibliographical data on significant early English editions of Scripture. 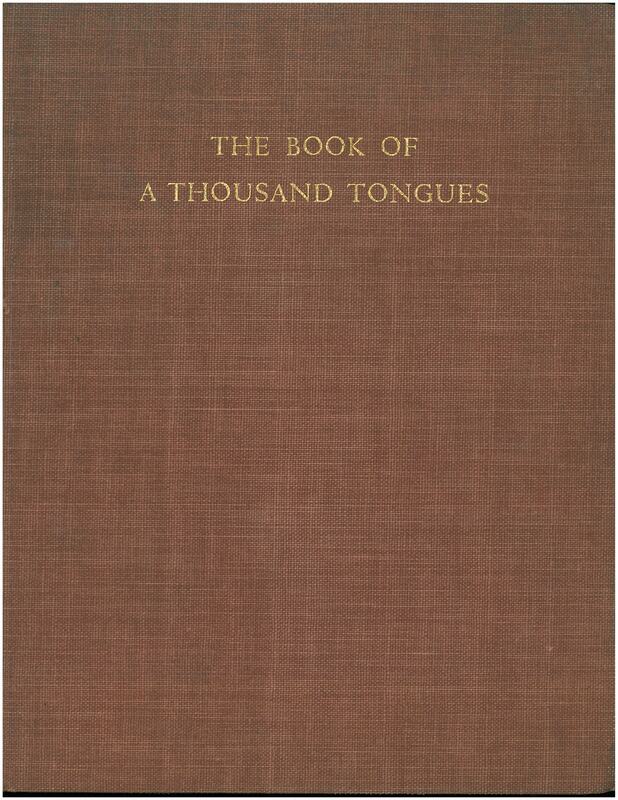 Comments Highly prized work by the noted 19th century Bible collector Francis Fry. 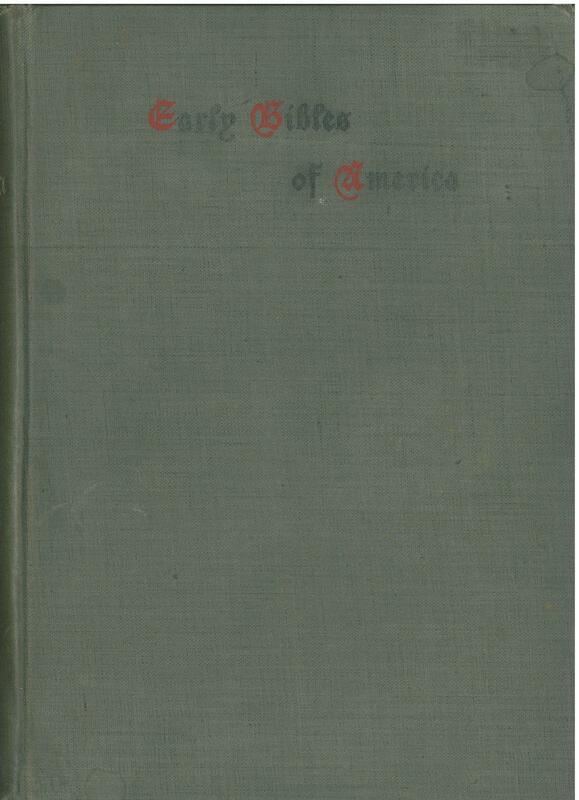 Contents Bibliographic and location information on scarce early American editions. 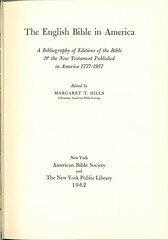 Comments The most valuable of several related works by this author for the student of early American Bible bibliography. Title The / Bibliographer's Manual / of / English Literature / Containing / an Account of Rare, Curious, and Useful Books, Published / in or Relating to Great Britain and Ireland, from the / Invention of Printing; with Bibliographical and Critical / Notices, Collations of Rarer Articles, and the Prices / at which They Have Been Sold in the Present Century / by / William Thomas Lowndes. / New Edition, Revised, Corrected and Enlarged. / Vol. I / London: / Henry G. Bohn, York Street, Covent Garden. / 1857. 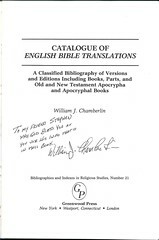 Comments The entries for "Bible" and "Testament" contain extended bibliographical data on many antiquarian editions in several languages. Several editions of the set appeared during the mid 19th century. Comments A sumptuously printed work on "large paper." 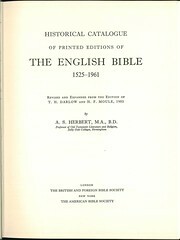 Contents List with detailed collations of early editions in the collection of a prominent British Bible collector. Comments Beautifully printed on "large paper." 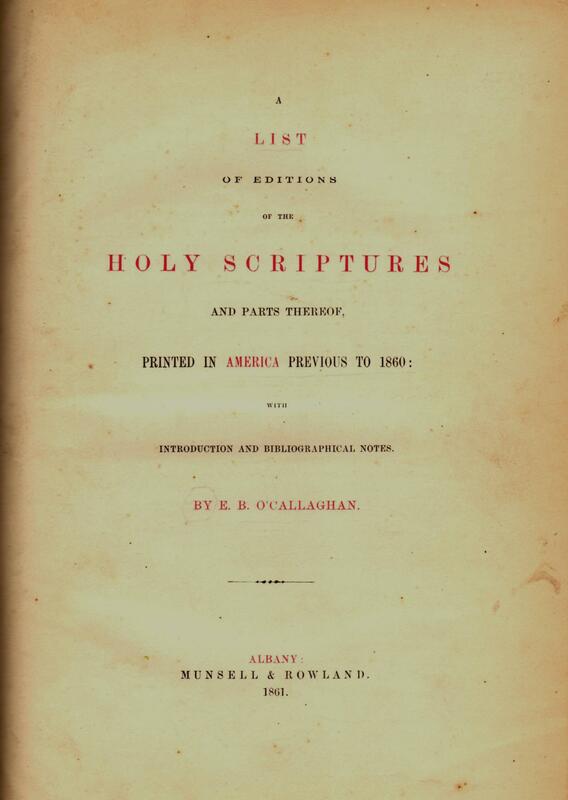 Title A List / of / Editions of the Bible / and Parts Thereof / in English, / from the Year MDV, to MDCCCCC./ with / an Appendix / Containing / Specimens of Translations, and Bibliographical / Descriptions. / by the / Rev. Henry Cotton, D.C.L. / Late Student of Christ Church, Oxford. / Oxford, / at the University Press. / MDCCCXXI. 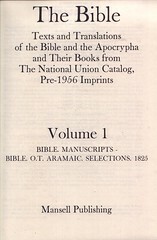 Comments First edition of Cotton's bibliography. 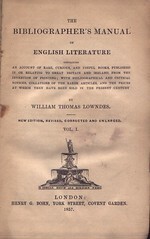 It was followed by a second edition in 1852 (infra). 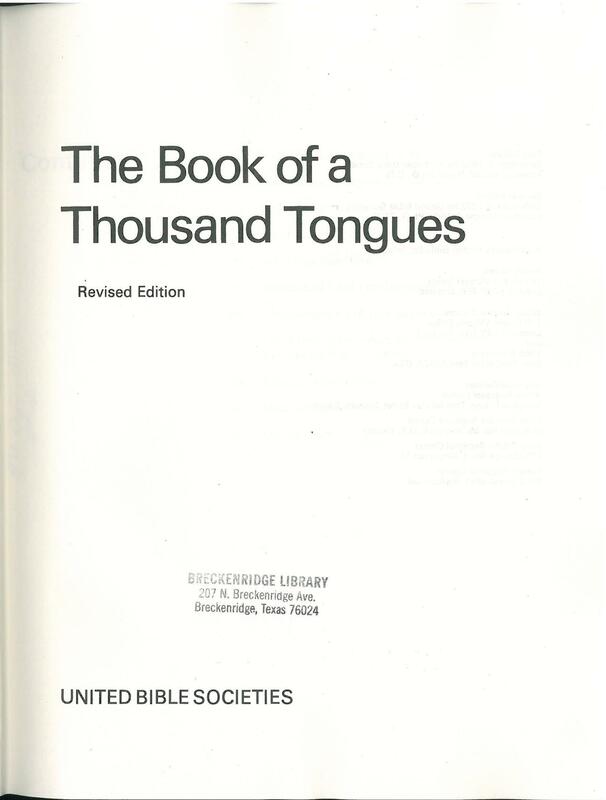 Title Editions / of / The Bible and Parts Thereof / in English, / with / an Appendix / Containing Specimens of Translations, and / Bibliographical Descriptions. / Second Edition, Corrected and Enlarged. / by / The Rev. Henry Cotton, D.C.L. / Archdeacon of Cashel, &c. / Oxford / at the University Press. / M. DCCC. LII. 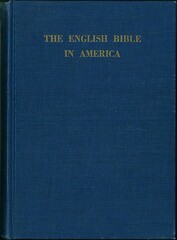 Comments The second, more comprehensive, edition of Cotton's work on English Bibles. 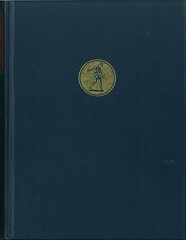 Recent Sales A copy of the original 1852 edition sold for $291 on December 15, 2011 on Ebay (Ebay No. 230714293671). 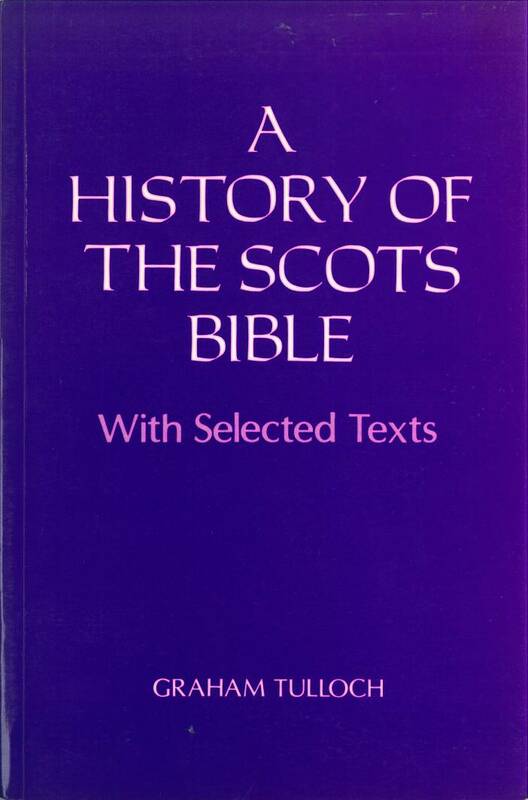 Comments: This is not an actual catalog of Bibles, but it provides a comprehensive list of Bible portions in Scots. 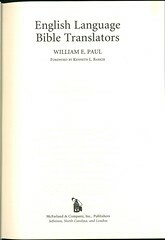 It also includes selected passages from all the translations listed. 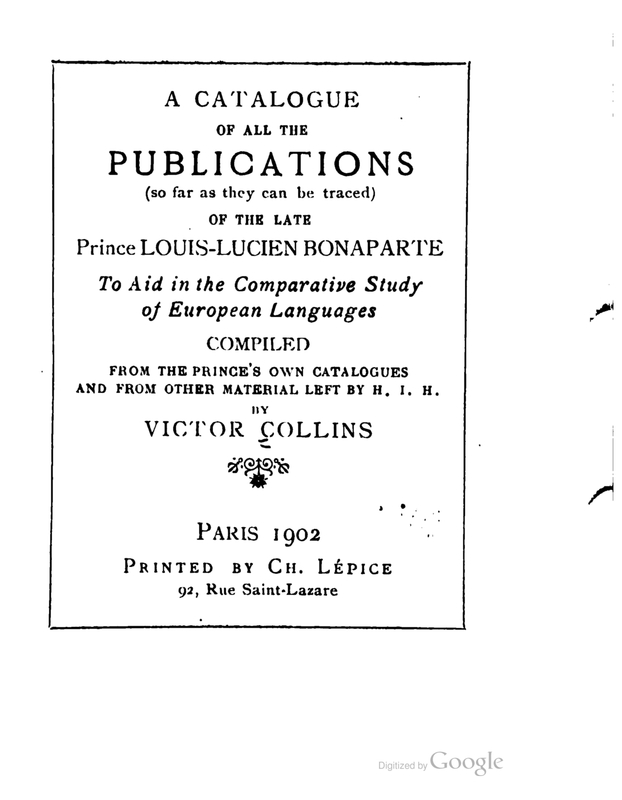 Contents: Catalogue of the works sponsored by Louis-Lucien Bonaparte. Comments: Edited by Eugene A. Nida, Ph.D., Th.D. Images: Volume 53 Title page, Volume 1 Title page. 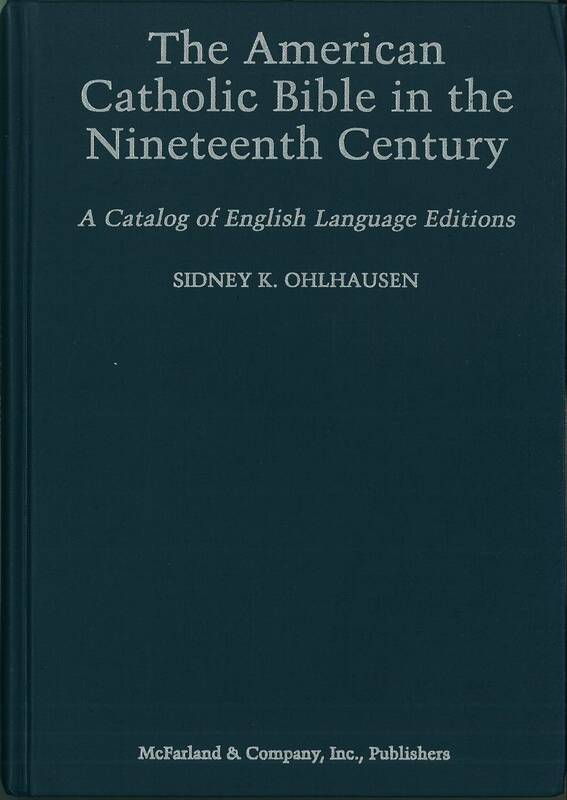 Comments: A set of 754 large volumes published over the years 1968 to 1981 cataloguing titles held in major libraries in the U.S. and Canada. Vols. 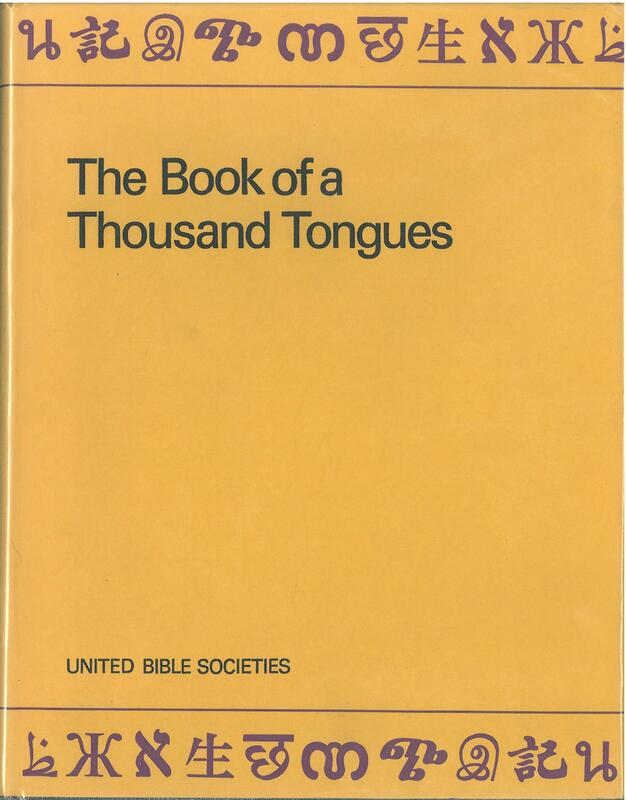 53 - 57 include a total of 66,898 listings for the Bible and its parts in approximately 700 languages and dialects plus an Index. 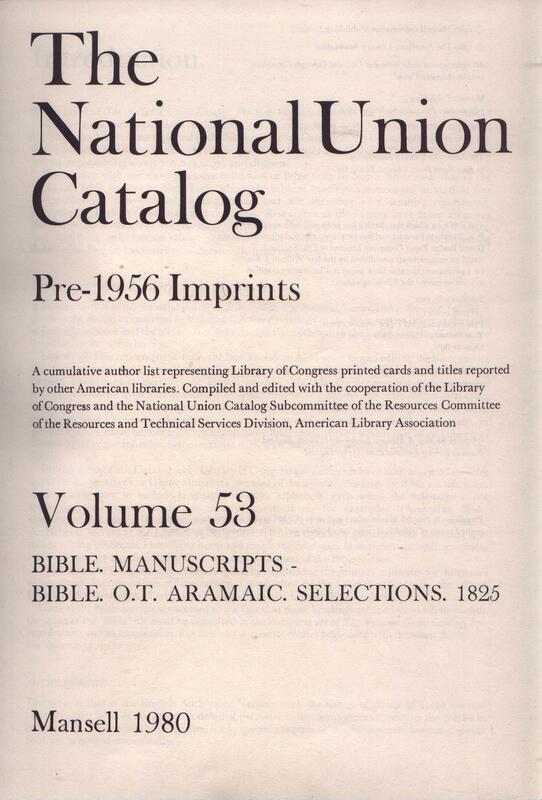 Volumes 53 - 57 were separately published in a self-contained set with the volumes renumbered 1 - 5. 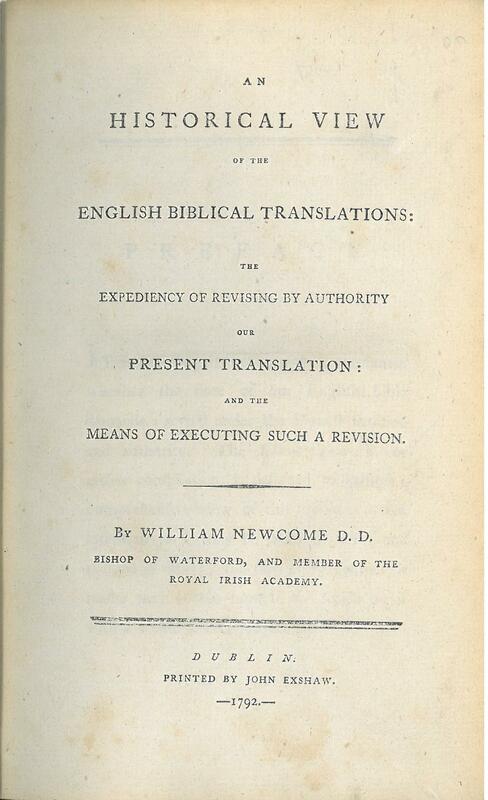 Title: An Historical View of the English Bible Translations: the Expediency of Revising by Authority our Present Translation: and the Menas of Executing Such a Revision. By William Newcome D.D. 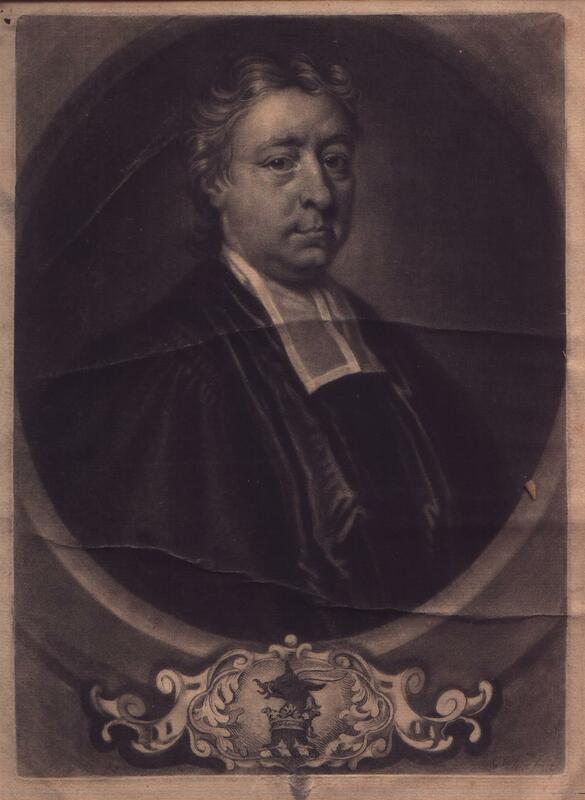 Bishop of Waterford, and Member of the Royal Irish Academy. Dublin. Printed by John Exshaw. 1792. Contents: At the end of the volume is "A List of Various Editions of the Bible, and Parts Thereof, in English From the Year 1526 to 1776. A Manuscript List of English Bible, copied from one compiles by the late Mr. Joseph Ames, presented to the Lambeth Library by Dr. Grifford, hath furnished some Part of this Publication: later Discoveries of several Learned Gentlemen have supplied the rest. First Printed: London: MDCCLXXVIII. (1778)." 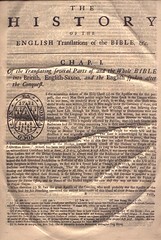 A supplement includes versions printed to 1792. 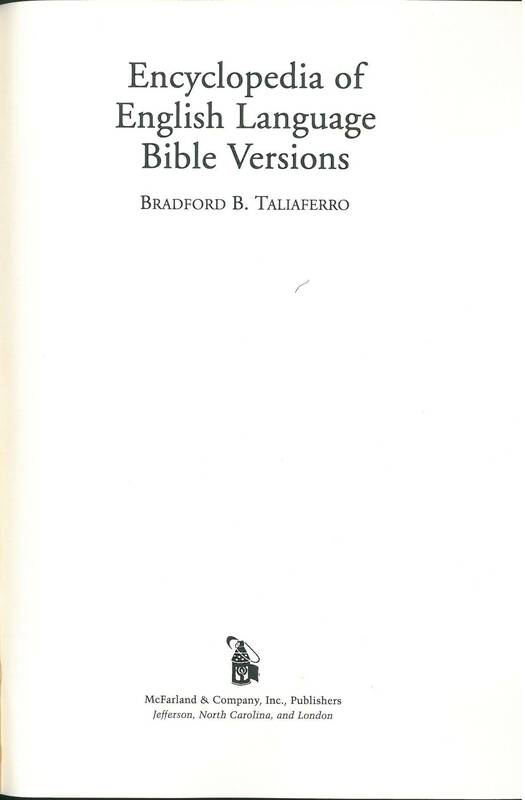 Also includes "Various Editions of the Psalms in English. From the Year 1505 to 1765." Contents: Includes Catholic editions of the Bible and portions thereof. 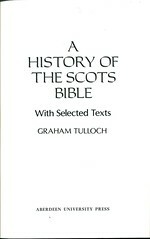 Original edition published in 1996.